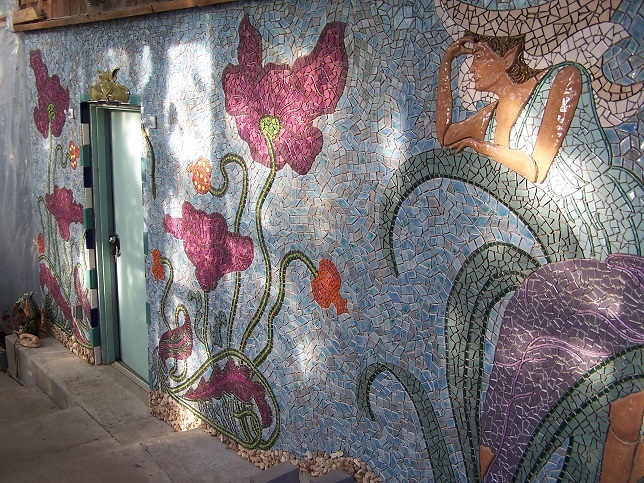 Our home was built as an artists place, where each of us may pursue his or her peculiar talent. When first envisioned, Grandma was needing to be diverted and her special needs were addressed, making our facility particularly well suited for the handicapped, sporting special steps throughout the grounds designed for wheeled chairs, and an elevator between floors at the main house. Our rural setting provides inspiration for the artist in each of us. The M.A.D. 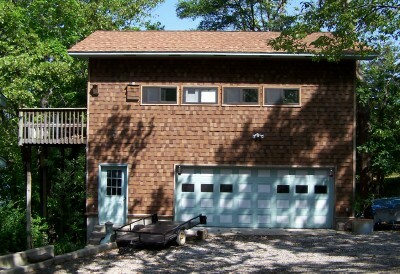 House Artists are in Oklahoma on Grand Lake of The Cherokees. Above is pictured the front entrance of The M.A.D. House Artists. 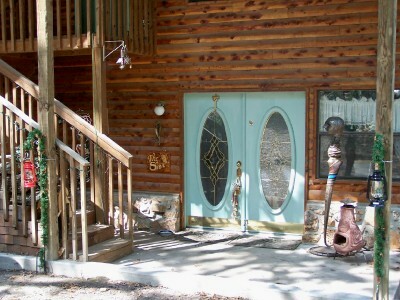 Door knocker and sculpture by Ronald Godwin, of ART WURKS in Brundidge, Alabama. The Door Knocker has the distinction of being one of three ever produced, and one the owners of the other two is Wesley Snipes. We feel that we are in good company there. The SHIRE event is held in the Library of the main house. In our dance studio we have monthly public dances, everything from Classical East Indian Dance to English Country Dance. 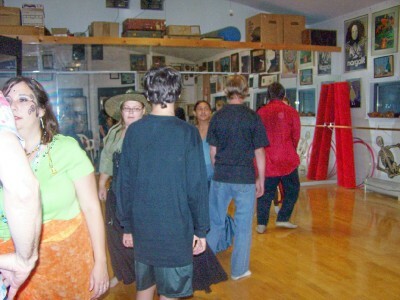 Saturday 11:00 A.M. classes are held for exercise, breathing and stretching, along with dance for enjoyment. Our monthly social dancing is fun and no one needs any previous experience. Everyone from grandparents to very small children have joined us and no one has had to be left out of the dancing. Sunday Afternoon at 3:00 P.M. Dad reads for us from his choice of books. 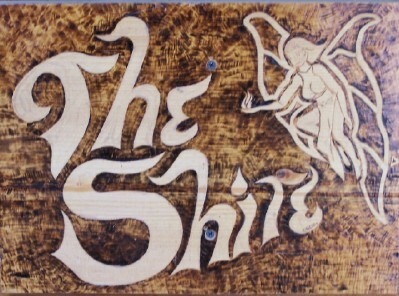 As Dad tends to lean towards the Fantasy genre, which is delightful, we call this event The Shire in honor of some of our favorite fantasy books. Come Sunday afternoon for a live performance to rival any we have heard in books on tape. Also at the Shire, Tuesday morning and early afternoon are set aside for painting and sculpting in an Art Workshop with Mom. 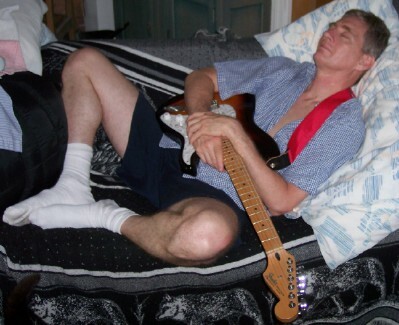 Dad actually was sleeping with his new Stratocaster. 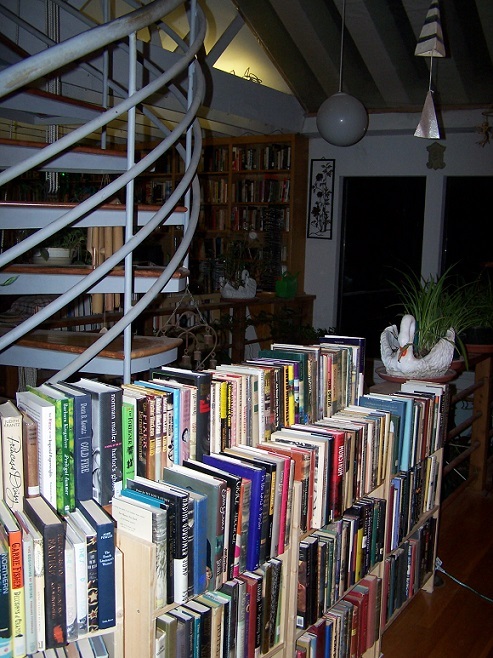 With over 1,000 ft. of shelf space, the books we have for sale are listed with images at books.themadhouseartists.com. Music, and Films are always here, for purchase, lending, or reference. The M.A.D. House Artists hold ongoing Film Festivals, concentrating on a particular director, actor, or theme. 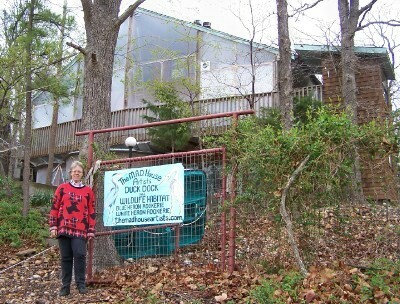 Here is Candace with the newly erected Duck Dock sign. The plastic keeps the wind off the back deck in the winter, and every day the sun shines, provides us with solar heat between 80 and 108 degrees fahrenheit. We really bought the Llamas for Grandma. As Esther was reaching the end of her lifetime of being Excessively Diverting, she was mainly suffering from Deadly Boredom. We, being of lesser giftedness, were at our wits end to keep her entertained. We planted gardens, attempted to get her to paint, brought in Cute Little Baby Animals, and did everything short of standing on our heads, and still she was torturing the Home Nurses, and being pretty miserable. Mom read on the internet about llamas being therapeutic for depressed people, and Dad said the fatal words: "All we need now is a couple of Llamas!" (He was kidding.) The Llamas (Both purchased through the internet) arrived too late for Grandma by about two weeks, but they were sure therapeutic for Mom! 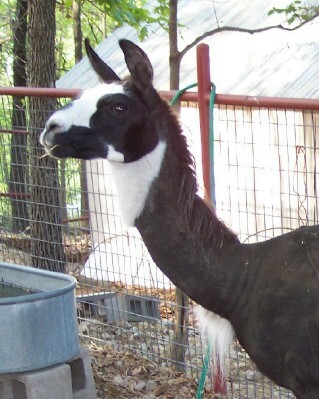 Our two Llamas are SIR CHARLE, (From North Dakota and The Sisters at the Monastery Llama Ranch), and MAGICAL FLAG, (From B&B Llama Ranch in Washington State}. Sir Charle was born in 1997, and Magical Flag is two years younger than Sir Charle. Magical Flag was only a yearling when he came to Oklahoma. Both are registered with the ILR, but we are collectors, not breeders, and both are geldings. Each year Mom rescues all the Turtles she sees in the road and brings them out to the woods here by the house, as far off the highway as possible, and near Grand Lake. Yertle (above, sporting her beautiful 'bow' design on her shell) was such a personable and responsive individual, we have not had the heart to release her. She lives in the Atrium Garden off the kitchen. For those of you who have been following Yertle's Tale for the past few years, you may remember the sad loss of her beloved Bubba, the Blind Turtle in 2003. Well, She had found love again in 2006 in the person of the vagabond Grendel (named by one of our Author friends, Doctor Philip Levin, in a contest). After a couple of days outside, it looked like they had really warmed up to each other until Grendel took a powder one night and ran out on her. Yertle was devestated. Mom noticed Grendel making tracks across the neighbor's driveway about a month after the escape, and restored him to the garden, where Yertle seemed only too glad to have him back. (No accounting for tastes.) But apparently the male turtles are not as adaptable to domestic life as the females, because Grendel and his 2007 successor, Red have both been returned to the wild. When they refuse to eat we cannot keep them inside and have them starve to death! Yertle remains sociable (and ravenous). When Kacie (See her art page) comes into the house, Yertle recognises Kacie's voice and starts for the edge of the pond to greet her. 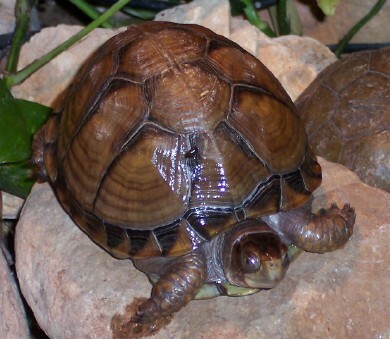 In 2008 we acquired Teeny Turtle, a very small turtle who recovered from her dog attack, suffering only the loss of one eye, and who has begun eating well and is rapidly becoming part of our family. Here is Alexander, a year and a half old, in December of 2005, enjoying bounty from Santa Claus on his first Christmas Eve. Many dollars later, and much help from Doctor Crockett and Dr. Gilsleider, Alexander Dog is the most healthy dog in Oklahoma. 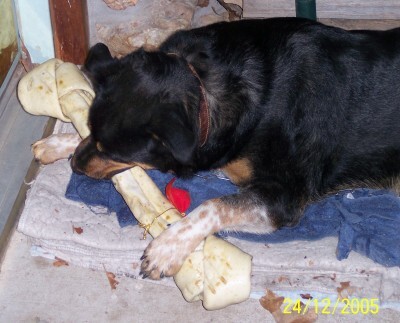 Alexander spent all of about five minutes on this 2005 Christmas Bone before it was completely demolished. ...Would anyone like a cheerful, sweet (and very enthusiastic) Dog? Dr. Gilsleider says Alexander is Ratweiller and Red Heeler mixed. Alex is healthy, has had all his shots, and is neutered, (of course.) No charge, Pick-Up only, no shipping available. Alexander took to carrying small logs (5" in diameter) around the yard as we attempt to cleaned up the damaged trees from the 2007 and 2008 Ice Storms, and he has only become stronger. Perhaps he could help you with your logging enterprise. Alex has calmed down considerably in his old age, but he is still a bit large for a lap dog. Sure keeps the yard free of Varmints! But if you wait much longer we won't be able to part with him, he sure grows on you (in more ways than one). Many nice photos taken by Mink on his web page. 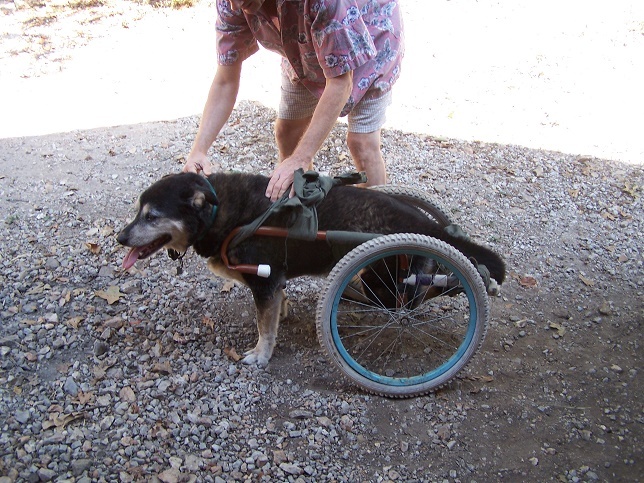 Now Alexander Dog is moving on into another phase of his life - As of October we are working on a design for his very own custom built wheelchair, The Alexmobile, to dignify him in his old age. Wheels donated by our local tire shop, design by Candace. This is a photo of the project in process in late September, 2015. Alexander is quite the Dog, patiently working with us. He is so strong and healthy, seems like he should not be slowed down just because his legs stopped supporting him. What a good dog. Many Thanks to the Herring family who supplied so many parts at such a reasonable price, and who offered helpful advice whenever asked. The M.A.D. 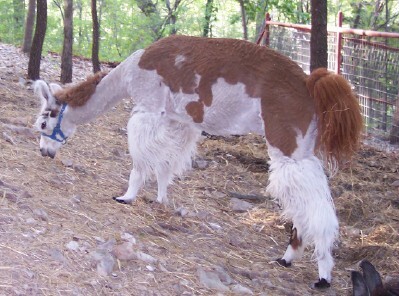 House Artists are host to a number of unusual pets. 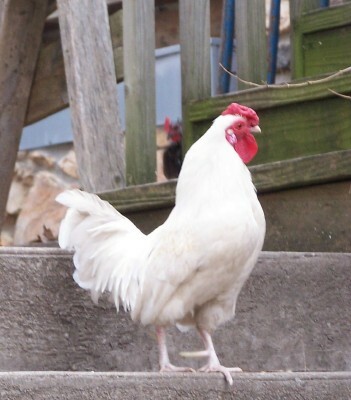 We have twenty named chickens and a guinea, two handsome gelded llamas, eight neutered & spayed cats, a neutered rabbit named Dot, goldfish, koi, tropical fish, Yertle the turtle, six Land Hermit Crabs, and two newts (John Cleese and Isaac Newton). In time Mom will feature each of them on his or her own page.